Biofuels from the termite gut? Eusocial insects are remarkable creatures, they divide their labour, care for their young and some of these insects developed agriculture long before modern humans evolved. Now it seems they could offer us a way out of the current energy crisis and our crippling reliance on fossil fuels. Releasing the sugars trapped in lignocellulose is the rate limiting step in bioethanol production and currently relies on chemical and mechanical treatment. 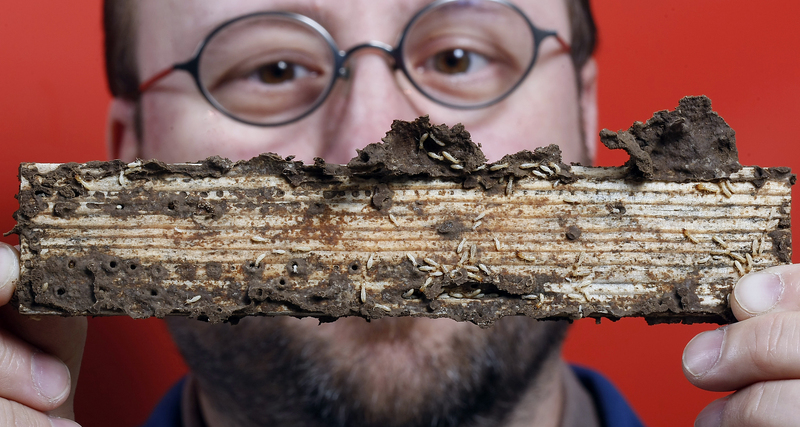 Termites feed on plant detritus and their guts can efficiently convert lignocellulose (also known as wood) into sugars. So how do they do it? It appears that termites work together with endosymbiotic bacteria living in their guts and that both contribute enzymes to catalyse the conversion of lignocellulose to sugars. In a recent paper published in PLoS ONE, Scharf and colleagues dissected the termite gut to separate out the upper gut (no endosymbionts) from the hindgut (with endosymbionts). When they measured glucose release from lignocellulose (in the form of sawdust), they found that the amount of glucose released by the whole gut was much higher than the combined values for the separated upper gut and hind gut added together. This is known as a synergistic effect and offers the first experimental evidence that both the host and the endosymbiotic bacteria contribute enzymes to the breakdown of lignocellulose into glucose sugars. In a first step towards using this system in biofuel production, the authors purified three host enzymes and demonstrated that these enzymes also act synergistically to release glucose from sawdust in a test tube. In other words, the host enzymes work together with each other and with enzymes released by their endosymbiotic bacteria to maximise the conversion of lignocellulose to glucose sugar. Ultimately, finding the right combinations of enzymes could enable bacterial strains to be engineered to convert lignocellulose into glucose in an energy-efficient way. This glucose could then be converted to bioethanol or butanol to fuel your car. Scharf ME, Karl, ZJ, Sethi A and Bpuccias DG (2011). Multiple levels of synergistic collaboration in termite lignocellulose digestion. PLoS ONE 6:e21709.